Introducing the best LED rechargeable book light you will ever buy, this may sound like a big statement but we believe the reCharge LED Booklight, from world leaders in LED technology Mighty Bright, fits that description perfectly. If you love great design and style then from the moment you see the reCharge’s clean, stylish lines and compact form factor you will be hooked. Made from a combination of durable ABS plastic and flexible Silicone rubber the reCharge exudes real quality and durability, and even though it’s compact it’s still packed full of features. Dual LED’s provide excellent light coverage that you can switch between high and low light, making the reCharge great to use without disturbing anyone around you. The smart dual flex gooseneck is not just built for style, it can bend in virtually any direction, so you can position the light right where you need it. 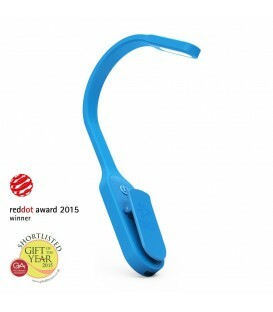 With a handy clip that will easily fasten to your book or e-reader the reCharge will be ready to use in just seconds. The low power light glows red which tells you when it’s close to needing a charge and turns green when fully charged. Just plug the handy USB cable that’s provided into your Computer or a USB plug and your recharge will be fully charged and ready to go in around an hour, and because it’s rechargeable you will never need to buy batteries ever again.